From the first track of Jazzmeia Horn’s 2017 “A Social Call,” it’s not difficult to see why she won the 2015 Thelonious Monk International Jazz Vocal Competition. On that cut — jazz vocal deity Betty Carter’s “Tight”— you can hear within a few bars that Horn’s voice has range and heft and a warm, grainy character. She tackles the intricacies of the uptempo rhythmic steeplechase with unruffled aplomb. She knows how to land on a syllable and make it count in a way that animates an entire lyric. And when her phrasing spins off from the lyrics into effusive scatting, with the occasional trill or yodel, it is, as Carter herself proclaimed about scatting, “not nonsense” — it’s the ineffable meaning beyond words. Horn, 28, first played Boston in one of the Celebrity Series’ Stave Sessions last year at this time. On Thursday, she plays the Gardner Museum’s RISE series, with Dorchester rapper Latrell James opening. The medley crystalizes the themes of the album — a “social call” (echoed in the Gigi Gryce-Jon Hendricks tune of that name), which can mean a night on the town or, as Horn writes in the liner notes, “the social issues that are alive today.” An intricate arrangement, it moves from African percussion and wordless vocal improvisation to the hard-bop Santamaria theme, to a spoken-word section of bearing witness (amid police sirens and crowd noise), and the consolation of the concluding spiritual. The “I’m Going Down” finale gives “A Social Call” the satisfying arc of a dramatic narrative, from that jazz-swing curtain raiser through ballad tenderness (a lovely version of Jimmy Rowles’s “The Peacocks,” with Norma Winstone’s lyrics), the emotional extremes of the “Afro Blue” medley, and R&B affirmation. It has a concept-album’s thematic unity and the pacing of a satisfying live concert. Horn’s next album will include more of her poetry, such as listeners got a taste of with “Eye See You,” and similar wordplay — in that case “I” representing the physical body, and “eye” representing consciousness. 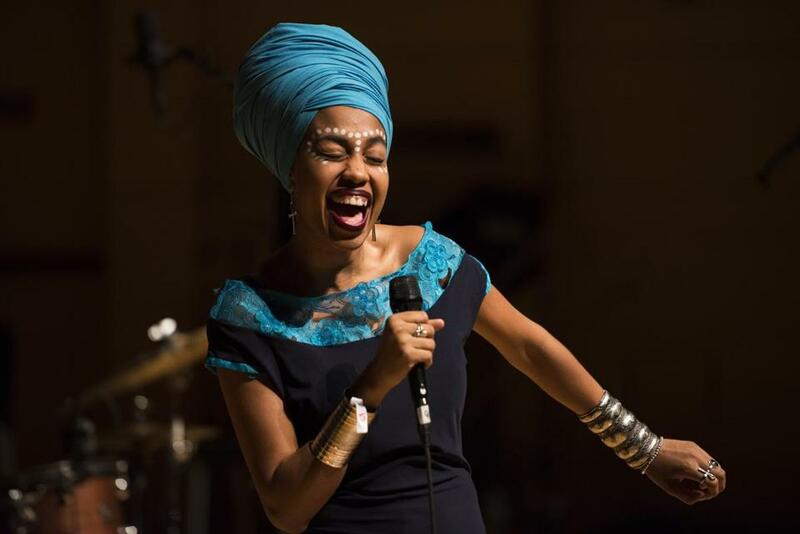 Due for a summer release, the new album will include about a dozen of her own songs as well as one by Rachelle Ferrell and another by Jon Hendricks.